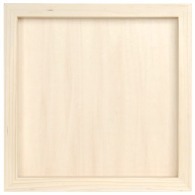 How about the option to display your work in Scrapbook Page Frames or Shadowboxes? 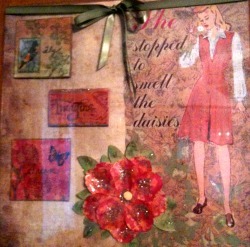 Have you ever created a Scrapbook page that you really wanted to show off for a while? Maybe you just had a single page the didn't have a coordinating page? I just love this idea and have 2 kinds of frames that I use for this purpose and I have now found a source for these that I wanted to share with my readers. First there are Acrylic Page Displays from Clear Scraps which come in 12 x 12 inch, 8 x 8 inch and some Tri-Fold Frames for sitting on a desk top. 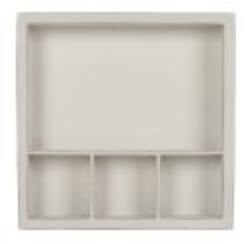 These Acrylic Page Displays are easy to use as you can slide a page in from the back where the top and bottom edges of the acrylic are folded over to the back side about an inch. I have used mine to hold pages that have embellishments and items about 1/4 inch thick with no problem. I made hanger using a small ribbon, tied in a bow on the front, and looped under where the acrylic folds down at the top. You could also make a hanger out of yarn, wire, tinsel, or fabric strips. These are great as you can change the hanger color and the page inside anytime you want. This is the current page I have in my Scrapbook Page Frame, but it only takes a few minutes to change it out, which I do quite often. Except for the reflection of light from the acrylic, you really can't see the frame, but it protects the page. There are 3 square chipboard items on the left and the flower at the bottom. You may be able to see the flower has some depth to it, several layers of petals and leaves and even a brad in the center, but is not mashed flat. Another option is to use Shadowboxes which I like when my page has embellishments items that can't really fit into a scrapbook or the Acrylic Frame Page. You can find Shadowboxes to hold a 12 x 12 or an 8 x 8 inch scrapbook page, or Shadowboxes with smaller compartments to hold individual photos or art work or keepsake items for display. You can use a Wooden Shadowbox, that you put an entire page in and decorate the frame with paint, sprays, paper or other embellishments. Or, you can use a Shadowbox that is pre-divided for a partial page and compartments for special keepsake items or photos. You can also decorate these with paints, dyes, inks, glitter, paper or anything your heart desires. Or try one of these great Shadowboxes by Tim Holtz called Configurations. 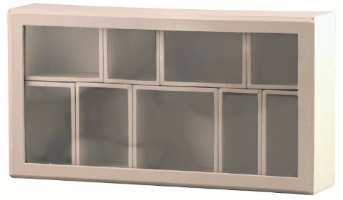 I have 2 of these and the little boxes on the inside can be moved around, removed to make larger spaces for your items, or even used separately. These come in several sizes and are almost 2 inches deep. So check out our Scrapbook Page Frames and Shadowboxes available for sale below. All items are handled through Amazon.com. Scrapbook Page Frames and Shadowboxes.